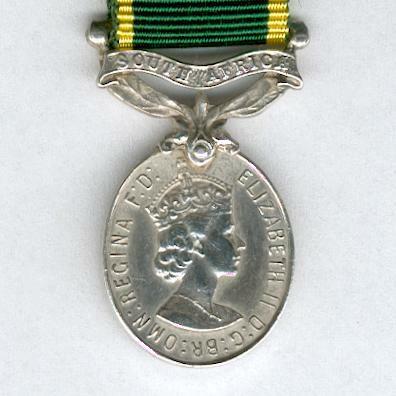 Miniature oval silver medal on ornate fixed suspension of two laurel leaves with ‘SOUTH AFRICA’ bar; the face with the Tudor-crowned head and shoulders of Queen Elizabeth II facing right, circumscribed ‘ELIZABETH II D: G: BR: OMN: REGINA F: D:’ (Elizabeth II by the Grace of God Queen of Great Britain Defender of the Faith); the reverse inscribed ‘FOR / EFFICIENT / SERVICE’; height overall 31.52mm (1.24 inches); on probably replaced correct ribbon. 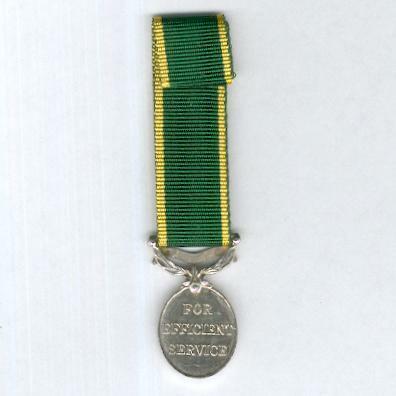 The medal was instituted on 17 October 1930 to simplify the then existing awards, replacing the Territorial Efficiency Medal, the Militia Long Service and Good Conduct Medal and the equivalent awards issued by Commonwealth countries to other ranks in the volunteer forces. 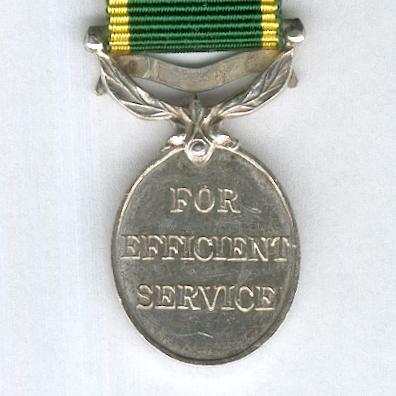 It was awarded for 12 years’ continuous efficient service (wartime service and also peacetime service in West Africa counting double). The Decoration was superseded when South Africa became a republic in 1961. 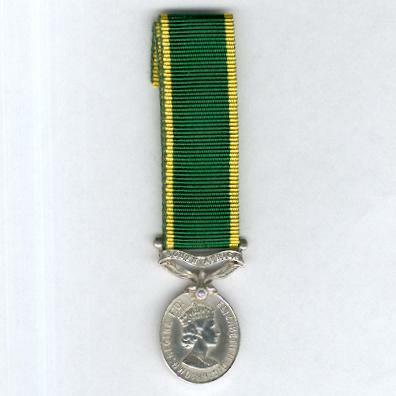 This example, with the queen’s head crowned and the words ‘BR: OMN:’ in the circumscription was issued only from 1953 to 1954.